I was bummed when the PR and Marketing for GameMill Entertainment failed Family Friendly Gaming. I was even more bummed when I finally got to play Monster Jam Crush It. 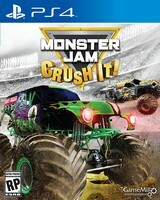 I am deeply appreciative of Family Friendly Gaming purchasing a copy of Monster Jam Crush It. This home console video game contains Stadium Race, Freestyle, Hill Climb, and Crash Mode. Most of the modes in Monster Jam Crush It have seven levels. Hill Climb has twenty-eight. There are twenty-five trucks in Monster Jam Crush It. Some of them are different schemes for the same trucks. Each of the trucks controls the same. Monster Jam Crush It is a rental at best. In my opinion this game is worth five dollars brand new. The controls in Monster Jam Crush It are loose. There are glitches and places to get stuck in Monster Jam Crush It. This monster truck game also has lag in it. Monster Jam Crush It might be the worst monster truck game I have ever played. I like monster truck games and have played quite a few. The rock music gave me a headache. All of Monster Jam Crush It can be beaten in one to two hours. I had trouble winning in the Stadium Race at first. Once I compensated for the loose controls I beat them all easily. Hill Climb is like a miniature Trials Fusion game with shorter levels and less strategy needed. Freestyle is where you go around crush cars and jump. Crash Mode is about finding the cars and making them all explode. How did the ESRB miss that violent content in their descriptors? Player must beat one level to unlock the next one. I would unlock different trucks at different intervals. Monster Jam Crush It did not explain what was needed to unlock anything. Some trucks were missed because I have no clue what is needed to unlock them. There are some gross trucks like the zombie one. Monster Jam Crush It feels more like an app than a home console video game.